Anyone has the CD included with Sound Blaster 16 Pro CT2950 (ISA)? The files in the CD should have dates around late 1995 or begging of 1996. I've been playing around with a Gateway Essentials 500 desktop PC for a little while now, turning it into a retro gaming PC for some light nostalgia trips. It has an Intel Warm Springs WS440BX motherboard in it and when I received it I noticed that it didn't have the most recent BIOS installed. After checking vogonsdrivers, Gateway support, and Intel support, I couldn't find exactly what I needed. Further digging through Google DID reward me with what I think is the final BIOS version for the WS440BX, being 4W4SB0X0.15A.0019.P14.0005091032. I flashed it to the board without problems and everything is working great. ntalaec wrote: Anyone has the CD included with Sound Blaster 16 Pro CT2950 (ISA)? I have an SB16 Value CD dated therearounds I will check nezt time I go to the storage. I don't see 7-zip 9.20 (last Win9x compatible version) listed in the Utilities section. Should it be there? I notice WinRAR is there. Perhaps there are copyright issues? I always install it on my 9x computers, and it seems to work with everything; even the context menu works and is immeasurably useful in my daily 9x usage. 9.20 was the last stable version of 7zip with support for Win9x. Last supported beta was 9.22. I prefer the 9.20 version because the options window fits in 640x480 resolution. Yes, I do. I hadn't noticed that before! I don't really use the file manager much; I tend to work in Explorer then just use the context menu to perform zip and unzip operations. Aztech Waverider Pro 32 - 3D: DOS/W3.1/W95 floppy disks v1.4.0. Belonds in the "WR32PNP" directory in the huge Aztech collection archive on vogonsdrivers, i.e. http://www.vogonsdrivers.com/getfile.php?fileid=788. Versions 1.00 and 2.00 are already in there. I've uploaded most of the stuff shared since my previous post. I'm having trouble with mega.co.nz at the moment, so I'll try uploading Schule04's files from another computer later on. Going to work out something WRT that big 2+ GB file. It's captured on archive.org for now though, which is good. I was asked by someone to provide this, possibly it is useful to add to the library. Here are the installation disks for the Media Vision Memphis. The hardware is fully compatible with PAS16 with SCSI as far as I know. 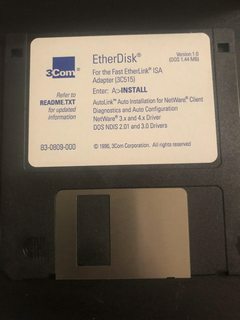 I had a working copy of the installation floppy disk. Its md5sum differed from the original however, so I included both. The CD also contains audio tracks so I copied it with cdrdao. I just uploaded my scanned and OCR'd copy of the Yamaha SY99 Operating Manual to archive.org. It is a much higher quality scan than the one available directly from Yamaha - downloadable for free... just an extra FYI so I don't get hammered for linking pirated stuff. I actually bought a used paper manual because the one on Yamaha's site is really, really bad in places. I wanted an actual readable manual and decided to share it. Scanning via a nice copier at work made it pretty quick. Then I ran it through our software to make it searchable. Soooo much better than Yamaha's copy. I also didn't destroy it to scan it. I unwound the plastic binding by hand and then put it back on after I was done scanning. I really want to make a nice bound book scanner in order to scan a bunch of other stuff that I would have to destroy in order to scan with a regular scanner. I figured since it really isn't driver related I wouldn't upload it to vogonsdrivers. Maybe we should have a manuals section on vogonsdrivers for vintage/retro gear.. that would be nice. cyclone3d wrote: I figured since it really isn't driver related I wouldn't upload it to vogonsdrivers. Maybe we should have a manuals section on vogonsdrivers for vintage/retro gear.. that would be nice. There is a manuals section on VOGONSDrivers but it isn't completely clear what it should be used for. Some people have used it for more than just driver manuals. What the hell is a driver manual? It's that thing you study before you get your license to drive. Duh. Just finished processing everything from my boxed Aztech Waverider Platinum-3D sound card that was sold as a Hi-Val Wave 96. The CD is an image. The floppies are in the zip as straight files as well as disk images. I also scanned the box art, manuals, and other paperwork. The PNP configuration manager should also work for other Aztech cards with the AZT2320 chipset.